This is my sixth installment visiting the bridges and structures of a great American river. In this outing, we visit the bridges, locks, and dams on the Missouri River. The mighty Missouri is the longest river in North America, wandering from its source in western Montana and heading south and east to its confluence with the Mississippi River at Saint Louis, Missouri. The Missouri River has three distinct sections. 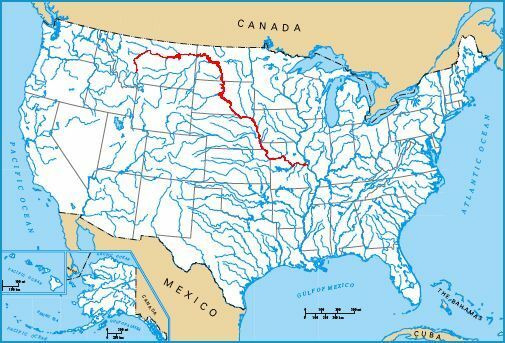 The lower river runs 735 miles from its confluence with the Mississippi River at Saint Louis, through Kansas City, and then to the river head of navigation just north of Sioux City, Iowa. The river is characterized by running through relatively flat territory that is prone to extreme flooding. The US Army Corps of Engineers has attempted to channelize the river, but once the river overflows its banks, it flows along the path of least resistance. The upper river flows through the Dakotas and eastern Montana, where the river is characterized by a series of monumental dams and giant river bridges. It is amazing to consider that these huge dams, some of the largest on the planet, are located over 1000 miles from the Gulf of Mexico. The headwaters area is located between the start of the Missouri River at the Three Forks, and continues east through Montana until the river enters Fort Peck Lake, the reservoir behind Fort Peck Dam. Through much of Montana, the river is much like a mountain stream. The highlight of the headwaters area is the waterfall at Great Falls, a key obstacle faced and conquered by the Lewis & Clark Expedition.